As a matter of fact, I just received the same figures from Shapeways in 1/96 scale for all those 1/96 to 1/100 scale ships and should be available soon. That is awesome news for my 1/96 CSS Tennessee! Rusty - can't see the picture, Flickr is showing "picture not available". I am becoming interested in modeling the USS Choctaw in 1/72. Do you have any plans to release these figures in other scales? Hi Rusty, I've updated your first post with the image found at your second post's link. The original link was to a photo called "FIGS_1", rather than "ACW NAVAL PERSONNEL 1", which is in your second link. Do you recall having a FIGS_1 photo that you've since deleted or renamed? As a matter of fact, I do now that you mention it. I was recently figuring how to use Flickr and I recall deleting it then immediately re-loading it. Obviously, I must have changed the file name. I also tried few different times to get the photo to load here. I thought I finally figured it out when I got the message saying the image didn't post. I'm pretty sure I got it nailed down now, so there won't be any mistakes in the future. I am in the process of uploading a ton of Flagship's photos to Flikr and I made certain everything was public. I'll make another announcement when I get everything ready to go. Everyone (hopefully) will be able to view all the photos and download instruction sheets too. Thanks for the correction, and I appreciate you keeping a watch on your site for problems like this. [quote="Timmy C"]Hi Rusty, I've updated your first post with the image found at your second post's link. Good call on cleaning up the figures and casting. I'm real sorry about the image problem. Maybe it's age or I'm just slow, but ever since I left Photobucket, I just can't get any new images to post here, so I'll give up on that and start just posting a URL from now on. The photos are here: https://www.flickr.com/photos/129785676@N02/27128634589/in/album-72157690684821165/ Hope this works. [quote="InchHigh"]Rusty - can't see the picture, Flickr is showing "picture not available". I am becoming interested in modeling the USS Choctaw in 1/72. Do you have any plans to release these figures in other scales? I'm real sorry about the image problem. Maybe it's age or I'm just slow, but ever since I left Photobucket, I just can't get any new images to post here, so I'll give up on that and start just posting a URL from now on. The photos are here: [url]https://www.flickr.com/photos/129785676@N02/27128634589/in/album-72157690684821165/[/url] Hope this works. 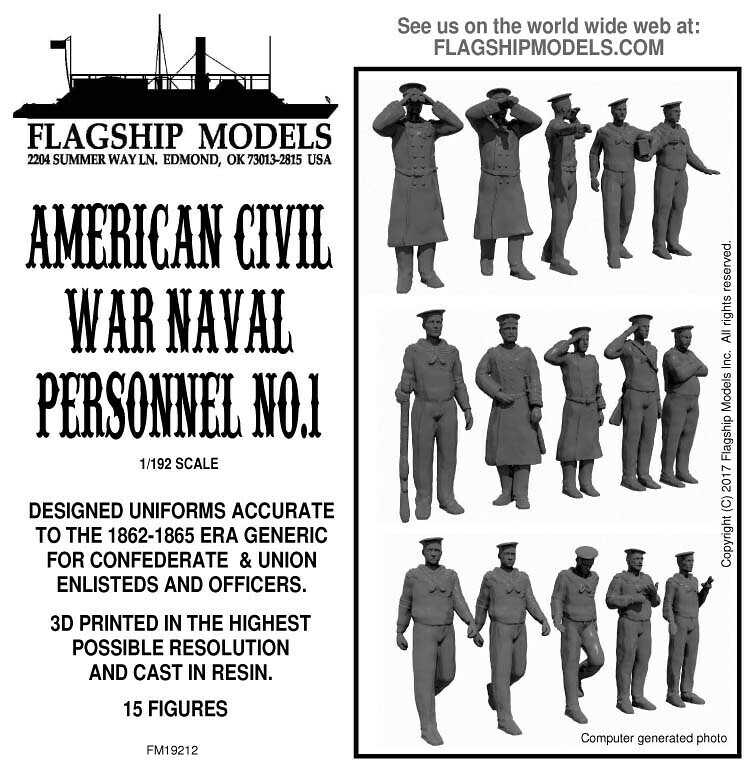 Designed specifically with the American Civil War naval modeler in mind, our 1/192 scale figures feature carefully researched uniforms and realistic poses from photos of the era. All figures are generic enough to be used on any Confederate or Union vessel of the era. The set includes 15 figures in various positions. All are 3D printed by our Shapeways vendor at the highest possible resolution for the cleanest detail possible and resin cast at our facilities. (Computer-generated photos) $19.95 + shipping on our web site.